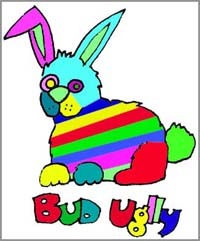 Alec has created a peter max-est type of picture, with all the wild stipes and colors he has created a bunny that looks almost on the verege of insanity. The unususl choice of colorz almost makes the bunny look like it needs a shave. The bright yellow eye stares the viewer down in a contest of wills.